Eragon and Saphira have just barely survived the latest battle between the Empire and Varden, and learned the truth about Eragon's parentage. Their encounter with Murtagh and Thorn has made them realize that they desperately need to revisit to their teachers in Ellesmera, but their multitudes of promises keep them from returning. They must help Roran recover Katrina from the Ra'zac, rally forces for the Varden, and find a way to thwart Murtagh. But along the way, they'll discover some dark secrets and learn the sickening methods behind their adversaries' strengths. Brisingr is a well executed follow up to Eragon and Eldest. It moves at a brisk and almost business like pace, only dragging slightly near the center of the book, as Eragon and Saphira struggle to fulfill their promises. Readers will be glad to see that the duo, Eragon especially, has not been placed upon a lofty pedestal, and still admit ignorance at times, an element that adds just the right touch of plausibility to the book. Paolini's descriptive writing is becoming easily recognizable, and his ability to draw similes and metaphors between the most unlikely objects only adds to his appeal, and contrary to what one might expect, will draw in reluctant readers. Like with the prequels, the author cleverly manages to sneak in colorful myths and historical stories into the book that only add the reality and vividness of Alagaesia, and make for a more engaging read. The plot of Brisingr is a little less developed than its prequels, and seems to serve more as a segue between the first two books and the conclusion of the lively series, although the revelation of certain secrets and the suspense and tension Paolini weaves into the pages will go a ways in making Brisingr a quick read. 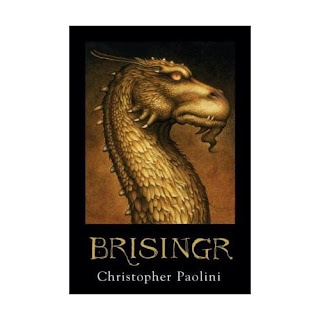 Seasoned Paolini fans will enjoy Brisingr, and be eager to move on to the final book. I bought Eragon years ago when it first came out and never got around to reading it. The movie came out and, while it was fun, I wasn't super impressed and so I've left the book untouched. I keep hearing good things about the writing and the series though, so maybe I need to dive in. I've been waiting to read this one, just haven't laid my hands on a copy! The movie was so horrible...I cannot even get into how bad it was. Poor Paolini...he was probably so disappointed. I'm not a fan of huge fantasy books, and these have been so hard for me to get through. I know the students love them, but when Brisingr came into my library I wanted to sob, knowing I would have to read it. Oh, well. That's why there are lots of different books! This series of Stories is worth reading when you're into the world of mythology. They start out much better than they end. The author seems to run out of steam in the last books.